Just 20 minutes north of Birmingham, the town of Brookside (population 1,363) is a small slice of nature and beauty next to the big city. The town is just six square miles and lies along the bank of Five Mile Creek, hence the name Brookside. Founded around the Brookside Coal Mine, which opened in 1886, the town was settled by Eastern European immigrants who worked the mines. When the mines closed in the 1920’s, Brookside saw economic troubles that have persisted ever since. Family-to-Family’s contact in Brookside is Todd Love of the Boys and Girls Club of Brookside. The club provides extensive after-school programs, including homework help and tutoring. 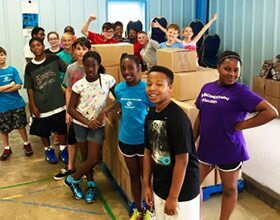 When the school year is over, the club runs summer programs to keep area kids healthy, fit, and happy. A large number of the children served by the Brookside Boys and Girls Club live in poverty, with an estimated 80% qualifying for free lunch at school. Many are being raised by single mothers or grandparents, and live in public housing. In Brookside, Family-to-Family partners with Publix Super Markets to provide groceries for our sponsored families.